North Korea may have accidentally hit one its own cities with a missile, it has been claimed. 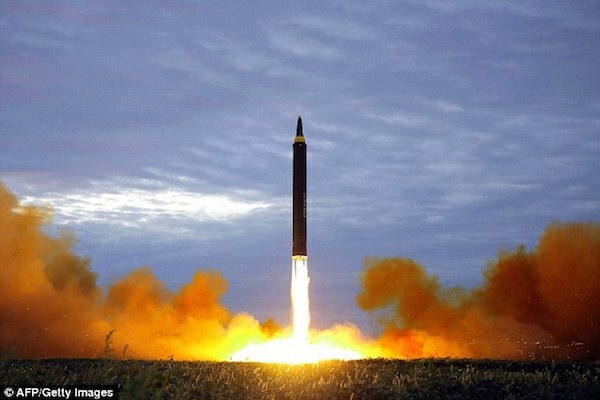 US officials said the Hwasong-12 intermediate-range ballistic missile (IRBM) was initially thought to have disintegrated mid-flight after it was fired on 28 April last year. However, new data suggests it landed in the city of Tokchon, around 90 miles north of the secretive communist country’s capital, Pyongyang. Tokchon has a population of around 200,000. A US government source said the missile’s first stage engines failed around a minute after it was launched. The report highlights the danger of another North Korean missile test failing at the wrong time. If the missile fell towards Japan, its trajectory may resemble an attack. The hermit kingdom, which has launched ballistic missiles over Japan since August 2017, gives no warnings before its tests, leaving nearby countries and the United States little time to determine whether missile launches are a test or a legitimate attack. Earlier this week, Nikki Haley, the US ambassador to the United Nations, said the US was hearing reports North Korea might be preparing to fire another missile. “North Korean Leader Kim Jong-un just stated that the ‘Nuclear Button is on his desk at all times’. Will someone from his depleted and food starved regime please inform him that I too have a Nuclear Button, but it is a much bigger and more powerful one than his, and my Button works!” the US President tweeted.